Home > Blog > What’s Happenin’ at Kennolyn? I like to think of our Summer Camp Spotlight posts here on the Everything Summer Camp Blog as being less like Blog posts and more like love letters. Of course, we have a lot of loves—that’s why we work with more than 270 summer camps across the nation. And there’s a lot to love about them. That’s why I sing their praises here on the Blog; and today, I’m singing the praises of Kennolyn Camp! When he got back home, that’s just what they did. 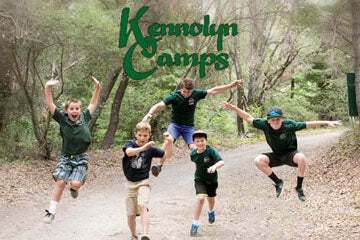 At Kennolyn Camp, you’ll fill your time with awesome activities such as Archery, Badminton, Basketball, Batting Cages, BMX Biking, Carpentry, Ceramics, Chess, Climbing, Crafts, Dance, Diving, Drama, Horseback Riding, Fencing, Forest Exploration, Gardening, Glee, Golf, Guitar, Animal Care, Cooking, Ropes Course, Ping Pong, Riflery, Ropes, Rugby, Self Defense, Soccer, Swimming, Tennis, Volleyball, and even more than that! Camp friendships are powerful, and living in a cabin group is one way to make lasting friendships while taking steps toward independence at the same time. With all the comforts of home, each cabin is unique with its character and its charm, and they all have electricity, windows, built-in shelves, bunk beds for up to eight campers, as well as an inviting front porch. Separate girls and boys areas lie on opposite sides of the camp. Look into Kennolyn Camp for your own camping experience! You can peruse their website by clicking here and, as always, thanks for reading, Camp Folks!